"My invitation to the citizens of Serbia is that from today we begin to look to the future, to maintain peace and stability in the region, to let our children live and open more factories... We must not shed tears on the past, but rather sweat in labour, to create a better Serbia", said Serbian president Aleksandar Vučić after the Hague International Criminal Tribunal for the former Yugoslavia (ICTY) pronounced a life sentence for General Ratko Mladić, commander of the Army of Republika Srpska. Speaking of the future, Vučić avoided commenting on the fact that Mladić was found guilty of the Srebrenica genocide, of crimes against humanity, and violation of the customs of war in Bosnia and Herzegovina. His message, addressing both the local and international public, could be interpreted as an attempt to put an end to an issue – the Srebrenica genocide – which still weighs on the relations between Serbia and Bosnia and Herzegovina. Some will interpret it as "loosening the grip" on the eve of the meeting with BiH Presidency member Bakir Izetbegović, announced for the beginning of December, aimed at convincing the EU that he is the leader who can guarantee the stability of the region. Many remembered that Vučić himself, at the time when he was a senior official of Vojislav Šešelj's Serbian Radical Party, had glued over the plates of the boulevar dedicated to Zoran Đinđić in Belgrade plaques reading "boulevar Ratka Mladića". In the Nineties, the current president was one of the loudest advocates of the war for the "greater Serbia". Therefore, his speech is a way to distance himself from his past. The message "look to the future" hides the inability – of both the political elite and most of Serbian society – to deal with the crimes of the Nineties, particularly with the genocide of Srebrenica. This has emerged clearly from the way most media have behaved before, during, and after reading the ruling against Mladić. 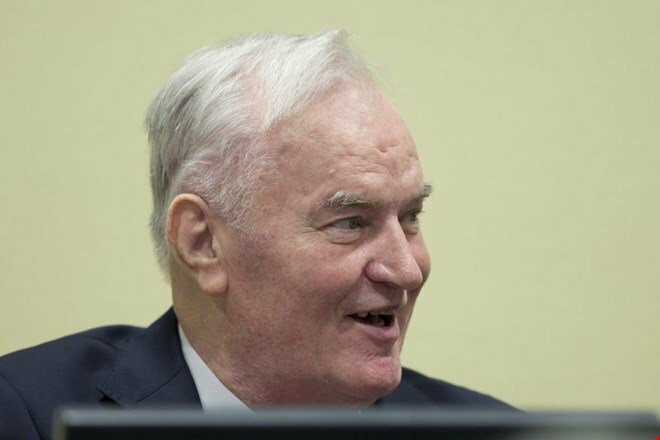 In the days before the verdict, especially in the pro-government press, articles about Mladić mentioned his "heroic biography", his precarious health, the world's plots against Serbia and Serbs, and the unfair judgments by the Hague Tribunal. "Was the Hague Tribunal the worst lager for the Serbs? "; "All the Secrets of Ratko Mladić"; "The Hague's Mengele kills Ratko Mladić"; "The Court's Criminal Strategy: Condemn Mladic, he dies within three months" – these were just some of the headlines in the Serbian press. Interviews with Mladić's relatives have further reinforced the notion of an announced ruling as devastating to the Serbian commander. Newspapers reported his son's statements – "They wanted to lock Ratko in an asylum" – or his wife's confessions on how secret agents had followed her when Mladić went into hiding, fleeing from the arrest warrant of the Hague Tribunal. Only some media, like N1 TV and the Danas newspaper, reported about the actual charges. Much more attention has been paid to the statistics and the analysis of judgments by the Hague Tribunal, depicted as an anti-Serb, politically oriented court. The tendency to ignore the charges and the verdict itself has been particularly evident in the way national television has covered the trial. The public service, Serbia's Radio Television (RTS) – the country's most watched and influential channel – was the only national broadcaster to provide live coverage. However, it managed to "hide" the verdict, as it only transmitted it on the second channel, much less watched than the first. Even though the date of the verdict had been known for some time, RTS did not bother to produce other contents on the charges, the trial, and Ratko Mladić, or to have commentators in the studio – to the point that, during an unplanned break in the trial, it aired a report about livestock. During the reading of the verdict, Pink television – one of the most watched (and government-friendly) channels – aired a debate that recalled the rhetoric of the Nineties, with just a couple of live feeds from the court. Five out of six guests (including former Hague defendant and leader of the Serbian Radical Party Vojislav Šešelj) explained viewers that there had been no genocide in Srebrenica, that Bosnjaks had been killed while trying to cross mined fields and in armed clashes, following the decision not to accept the invitation of Mladić's army to return to their homes – all accompanied by conspiracy theories on foreign officials and the Court itself as enemies of the Serbian people. The remaining three national broadcasters did not cover the ruling at all. Only thanks to the N1 cable television were viewers able to see and hear – in a special programme that lasted all day – about the verdict, the charges, and the the work of the Tribunal, with commentary by important figures and local and foreign officials. Those who could not watch N1 were able to stay informed on what was happening in the Hague Tribunal thanks to portals and social media, which in recent years have become the most trusted media for many citizens of Serbia. The day after the ruling, tabloids' headlines read: "Mladić after the verdict: I was condemned by NATO", "Liars, I will f*** your mothers", "My people's tribunal is more important than the Hague: I will live 124 years", "It's all a lie: wife, son, do not weep, it's just the first round". The articles on the sentence read: "This means: killing Serbs is not a crime", followed by statistics showing that Serbs make up the largest number of defendants at the Hague Tribunal, together with data on the blood pressure of the former general, measured during the break in the reading of the judgment. In particular, papers stressed that Mladić was not found guilty of all 11 charges, and that the genocide charge was dropped in 6 municipalities of Bosnia and Herzegovina. Of the 8 national newspapers, only Danas, Politika, and Večernje novosti have extensively reported the reasons for the verdict. Večernje novosti took it a step further, sending a journalist to Mladić's native village to talk with his relatives, and even to the village where he was hiding until the arrest and where, as the headline says, "Ratko's old dog still stands guard". However, one can expect the verdict to be soon forgotten in Serbia. On the day it was pronounced, just a few dozen citizens led by the Dveri party gathered to protest in downtown Belgrade, only to leave in a hurry. The next day, the ruling was not debated in the session of the National Assembly, while the most watched TV news programmes put the reactions to the verdict after other, apparently more "important" news. In line with President Vučić's invitation to "look to the future" without "shedding tears on the past", and with the media silence about crimes that took place just over 20 years ago at a hundred kilometres from Belgrade, Serbia will obviously remain divided for a long time over "heroes", crimes, and responsibility in the wars of the Nineties. Both Srebrenica and Mladić will serve, if and when politically necessary, to create future tensions between Serbia and BiH and in the region, or to rage against the "unfair" international community. Judging by the way newspapers and TV have informed the public so far, Belgrade's government can count on the virtually unconditional support of the Serbian media, that diligently follow the indications that come from the rooms of power.